Hi everyone, I’m happy to introduce a new feature called “Guide Tabs“, you can find the settings for this option in the display section. With this feature it you can have up to 4 guides loaded at the same time and you can instantly switch between guides. For example you might want to load a profession guides without loosing focus with your leveling guides and switch between guides as you level. This is now possible with the new guide tabs. The setting can be set between 1 to 4 and this will display the number of available tabs on that will appear when you mouse hover the Small Frame (Guide Steps) area. With this feature you can select multiple guides to be loaded at the same time. To load a guide simply left click on a tab or empty tab and select a guide from the large frame like normal. Switching between the tabs will automatically update the waypoint arrow to match the selected tab. 7 replies to "New Guide Tabs Feature"
I love this feature. 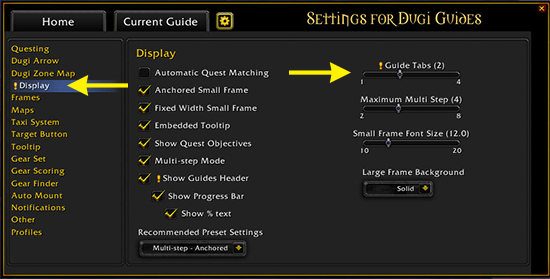 However I would like to suggest being able to select the tab the guide loads to when it pops up as is the case when joining a dungeon. Every time this happen and I select to load it, it will wipe out all my other guides and I will have to reselect them. OK, if this works I will love it. BTW I noticed that some of the points where it says an achievement is are incorrect. Just making an observation. I still love Dugi guides. This will be awesome for some of the holiday stuff – especially those that have you travel all over. I like getting some of my exploration achievements done while doing this. Having to switch between the Halloween and exploration guides was a bit painful. This will totally eliminate that! That’s a nice feature, no more switching in-game.